Going into the World Cup, corporate America, the nation's youth, millions of viewers, sports networks, fans and a growing league show the U.S. really does care about soccer. PORTLAND, Ore. (TheStreet) -- Who cares about soccer? 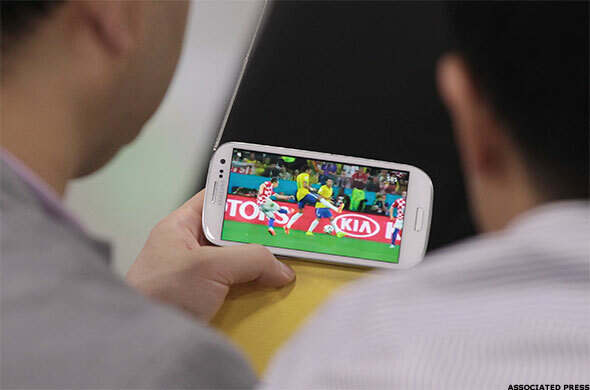 Companies like Fox (FOXA, Comcast, (CMCSA - Get Report) and Disney (DIS - Get Report), certainly, as they've bet considerable resources on Americans tuning in to the World Cup. But still, every four years, someone whose feelings are hurt because the world isn't paying enough attention to their football/baseball/basketball/hockey team or NASCAR driver of choice asks this question. Each year, there are fewer people doing the asking and more doing the explaining. Soccer is growing in the U.S. and its viewer base is getting a whole lot bigger. This one seems a little obvious, but we can't discount them. According to Nielsen's 2013 Year In Sports Media report, 40% of the small television audience for Major League Soccer consisted of viewers 35 and younger. That's a younger following than that of the National Football League (29% that young), college football and basketball (26% and 29% respectively), Major League Baseball (24%, with a whopping 50% of its audience aged 55 or over) or NASCAR (14%, with 49% 55 or older). Also, when it comes to drawing viewers from the growing Hispanic population in the U.S., nothing comes close to MLS. A solid 34% of its viewers are Hispanic, compared to 9% for Major League Baseball, 8% for football and a scant 4% each for March Madness and college bowl games. As for attendance, the average 18,608 that went to Major League Soccer matches last year is up from 14,898 just a decade ago. New franchises are coming to New York, Atlanta, Orlando and Miami. Stars like Spain's David Villa and England's Frank Lampard are making the jump across the pond and home-grown talent is succeeding in small, thriving markets like Kansas City, Salt Lake City and Portland. The league also just received a new $600 million television deal from ESPN and Fox (FOXA that will keep it on air through 2022. We'll let one of our readers address this little detail. @Notteham There's a difference between lightly gilded xenophobia and the inability to enjoy a sport. Its important to tell the two apart. The standard thinking is that if it isn't a "'Murican" sport, the U.S. public won't like it. That excuse has been used with hockey; it's used (more speciously, given its origins) with lacrosse and we'll continue to hear it with soccer. This hasn't stopped soccer, a British sport, from becoming intrinsically linked with Brazil, Germany, Italy, Spain, Argentina and a host of other countries where the British Empire's sun never set. But, for argument's sake, let's say it was a primarily British sport. That didn't stop NBC from paying $250 million for three years' worth of rights to English Premier League matches back in 2012. It also didn't stop U.S. viewers from tripling EPL viewership in this country from when Fox Soccer and ESPN held the rights during the 2000s. This season, 30.5 million fans have watched the EPL on NBC and its associated stations. The National Football League draws that for a playoff game, but many Sunday EPL matches air well before NFL games and get close to 1 million fans up as early as 4:30 a.m. E.T. to watch. The whole enterprise brings in $83 million a year in revenue for NBC, which is more than happy to get it. But what if we argued that, in North America, soccer is a Mexican gam? Even if that stretch were the case -- and American Outlaws' supporters throughout the U.S. seethe at the thought -- ESPN managed to sign a deal with Mexico's Liga MX that allows it to broadcast matches on its English-language networks through 2015. That deal includes access to 83 million homes and a host of mobile devices through its ESPN3 streaming service and the WatchESPN app. Why, because ESPN Deportes coverage grew 36% during the year before the deal was announced and drew hundreds of thousands of fans in audiences larger than English-language NHL broadcasts. Oh, and because Liga MX audiences bring in $50 million in revenue of their own. The U.S. has developed a habit of beating Mexico 2-0 in Columbus, Ohio, every few years or so. It happened in World Cup qualifiers 2001, 2005 and 2009. When it happened again in September, a record 9.7 million viewers were watching on ESPN. A few months earlier, when the U.S. escaped Mexico City's Azteca Stadium with a 0-0 draw, 7.2 million viewers tuned in to ESPN to witness it. Even when the U.S. plays Mexico in a friendly, as it did in 2012 when the U.S. earned its first-ever victory at Azteca, 5.3 million viewers tuned in. In the last 20 years, U.S. viewers watching the World Cup haven't been particularly picky about who's playing or what gender the players are. The most-watched soccer match in U.S. history was the 2010 World Cup final between Spain and The Netherlands. It was a 1-0 match riddled with yellow cards and, on paper, was exactly the kind of stereotypical global soccer that makes red-blooded Americans check the calendar to see when the NFL kicks off. However, it drew 24.3 million viewers for ABC: A larger audience than that network drew for an Ohio State/Oregon Rose Bowl (24.04 million) that year and one larger than the 2010 men's college basketball national championship game between Duke and Butler (23.99 million) on CBS, the Winter Olympics closing ceremony on NBC (21.4 million) and a whole lot of prime-time Winter Olympics coverage. When 19.1 million viewers tuned in earlier that year to watch the U.S. team's second-round match against Ghana -- the largest USMNT television audience of all time -- it was a bigger draw than all but Game 7 of that year's NBA Finals on ABC and outdrew the U.S./Canada men's hockey gold medal game on NBC (18.3 million). Yes, U.S. viewers will turn out for a 2010 World Cup matchup with England (17.1 million viewers) or a 1994 second-round tip with Brazil (13.7 million), but they'll just as soon watch the 2006 final between Italy and France (17 million) or the 1994 final between Italy and Brazil (18.1 million). They'll even flock to women's soccer when the chips are down. Eighteen million U.S. fans watched the 1999 U.S. Women's World Cup win over China on ABC, while 13.5 million tuned in for the 2011 final against Japan on ESPN. It may take them a while to get around to it -- only 3.9 million watched the U.S. women's incredible 2011 performance against Brazil -- but they "care" when the stakes are high enough. We've already mentioned that youth is the driving force behind MLS and its broadcasts, but it's driving U.S. soccer's future as well. U.S. Youth Soccer is up to 3.02 million players from just 1.6 million in 1990. That doesn't include the hundreds of thousands who play in other organizations like the 650,000-strong American Youth Soccer Organization. There's some attrition, sure, but even the soccer-hating Wall Street Journal recognizes that youth participation in soccer is still double that of tackle football and bigger than baseball by about 1 million participants or so. It also helps that there are now 79 U.S. Soccer Development Academy facilities separating the great players from their more recreational peers, teaching them the international system and feeding them to MLS, EPL and Italian Serie A teams. But even those who don't make the jump have an impact. For example, when Electronic Arts (EA sells its FIFA line of soccer games, the North American market trails only Europe in overall sales. Last year's FIFA Soccer 13 sold 2.04 million of its 10 million copies worldwide here, compared to roughly 1.6 million in all countries beyond Europe. That's not only not bad for a nation that "doesn't care" about soccer, but it's making believers out of soccer's sponsors as well. Allstate (ALL, AT&T (T, Anheuser-Busch In-Bev (BUD, Clorox (CLX General Motors (GM, Nike (NKE, Marriott (MAR, Panasonic (PCRFY, Pepsi (PEP, McDonald's (MCD, Mondelez (MDLZ and Visa (V are among the companies pouring cash into U.S. Soccer and building infrastructure for kids, coaches, professionals and the national team alike. So if corporate America, the nation's youth, millions of television viewers, giant sports networks, a growing base of professional sports fans and one of the fastest growing leagues in the U.S. all care so much about soccer, why are they forced to explain themselves every four years to people who can't see that the big U.S. soccer boom has already happened? Seeing the direction the sport is taking in this country, perhaps the better question we should ask in the U.S. during the World Cup is this: Who doesn't care about soccer?